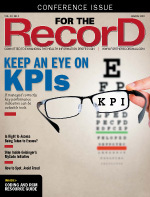 Lost in the shuffle of minding budgets, keeping the C-suite happy, and ensuring schedules are met, there's another often-overlooked reality of any EHR implementation: HIM professionals—the legal guardians of the health record—must be key participants in any process involving the integrity of patient records. While this is undoubtedly true, it isn't necessarily the reality at most health care organizations. For various reasons, HIM professionals are frequently left out of the EHR implementation process. Often, this oversight is beyond the HIM manager's control. Nevertheless, there are several strategies HIM managers can employ to rectify this situation. Be seen: There is a tendency for overworked, overstressed HIM professionals who are barely managing to keep up with countless to-do lists, budgets, productivity reports, and committee meetings to lose sight of how to be recognized (seen). When executives witness the strategic value of a subject matter expert, the invitation to be part of the team occurs more frequently. How is value demonstrated? Education, promoting awareness (via marketing), and report cards demonstrating quantitative improvement trends are among the best tools to illustrate HIM's EHR sophistication and prowess. Be involved: Volunteer to talk about new legislative changes (eg, hierarchical condition category coding, MACRA, MIPS) to core executives or a physician group or explain the need to improve documentation and coding skills to accommodate the demand these changes will have on the EHR's documentation requirements. Introduce an "open house" day where hospital staff can learn about different HIM functions such as release of information, deficiency analysis, and transcription. Viewing HIM functions through a self-marketing lens allows the HIM manager to enjoy a pat on the back without bragging and boosts the image of expertise, ie, someone who should be involved in an EHR implementation. Be informative: Providing report cards focused on both the quality and quantity of HIM metrics alerts the executive team to the importance of such data. This makes it easier for executives to recognize the variables and reasons behind productivity slowdowns that may be pinpointed to the EHR. What are the benefits of being seen, being involved, and being informative? It may seem like an inordinate amount of time and hard work just to be involved in EHR implementations. However, the long-term payoff can be significant. Those involved in the EHR implementation process help set the rules. Did you ever volunteer to take minutes at a committee meeting? Some individuals refuse to take on this task, believing it will result in them being perceived as a less skilled participant. Not true. The person assigned this responsibility gains a greater awareness of the topics discussed and can be sure to include thoughts from an HIM perspective that may otherwise not get noted in the minutes. With items on record, there's a greater chance HIM will be noticed when the project begins to shape. HIM managers involved with EHR implementation can ensure certain standards are met during workflow design. For example, are episodes and encounters listed correctly and in chronological order to represent hospital visits and not intermingled with physician office encounters and notes? Do coders and clinical documentation improvement staff view the same documentation and physician queries? Do coders have to reenter diagnoses and procedures into the encoder and query system separately? Are physicians permitted to use copy and paste, potentially resulting in data integrity problems and fraudulent billing? Another benefit of HIM being part of the EHR team is that it keeps the department in the loop with regard to what's happening in the organization. For example, being on the team helps ensure staffing and workflow issues surrounding the implementation do not conflict with other HIM-related activities. Imagine attempting to implement an EHR system during a scheduled audit or a Joint Commission survey. Educating the team—and the EHR vendor—of conflicts when planning master schedules can avert a scheduling disaster. When the moment of truth arrives and HIM managers become active members of the EHR implementation team, it carries great responsibilities, some of which may be unfamiliar. To stand out in the new role, preparation is key. Be sure to network with other colleagues or consultants that have already been through the process of installing an EHR or converting from one system to another. Vendors are also helpful in providing references and site visits and even a more thorough understanding of any confusing functionality. Don't forget vendor user groups—those who participate get to provide input in determining future enhancements and functionality improvement. The following best practice tips can catapult HIM managers into becoming valuable participants in EHR projects, which builds confidence levels and leads to a rewarding experience. Understand basic EHR/computer terms. Neophytes to the EHR world must familiarize themselves with the technical and clinical terms they may encounter during the implementation. The quickest way to have one's input be disregarded is to appear uneducated about the system. Study the available vendor information to help grow that expertise. HIM professionals are typically accomplished communicators and documenters; once entrenched in the implementation, don't be afraid to take a leadership role. Understand the clinician point of view. A thorough understanding of clinical workflow (current and ideal) in each service area allows HIM managers to better represent their constituent workflow needs as they become involved in designing screen flow. This includes inpatient, outpatient, and postacute care settings, as well as physician clinic and ambulatory environments. HIM professionals are unique in that they're well versed in the clinical, financial, and administrative functionality of the health care environment. Understand the active vs discharge legal health record. Don't forget the needs of the active care encounter as well as the postdischarge documentation-based encounter. Once a patient is discharged, all documentation must be visualized in a postdischarge record that should no longer be dynamic in nature. Additionally, all subsequent amended/completed documentation must be added to the record without displacing, replacing, or changing any prior documentation. Facilities that do not have two types of records (dynamic and postdischarge stable) in place may find it difficult to defend their archived medical records. HIM professionals can help ensure these needs are addressed. Understand archive policies. Remember to discuss issues such as long-term retention and the purging of records. These topics often get ignored; however, it is just as critical to have these types of policies in place as it was when paper records were commonplace. With interoperability an industrywide goal, defining how records are systematically destroyed is paramount. One of the most common complaints heard about EHRs is the fragmentation of content. If locating this information is difficult in the active record, how well thought out and documented must be the retention and destruction of all electronic documentation? HIM professionals are trained to identify how to approach this challenge from a policy point of view. Regardless of environment, participation in an EHR implementation can be a rewarding, career-changing experience for HIM managers who dedicate the time and exert the energy to actively make a difference in the success of such a critical project. — Darice M. Grzybowski, MA, RHIA, FAHIMA, an AHIMA-approved ICD-10-CM /PCS, trainer, and ambassador, is the president of HIMentors.